Last month, my workplace participated in Australia's Biggest Morning Tea. Here's the idea: we could choose to contribute by baking some treats to share with the office, or simply make a reasonable donation to partake in the delights. The funds we raise would all go to the Cancer Council. It's a great cause, and of course, I decided to do both! Mandarins are in season at the moment, and wonderfully cheap. If you go to the markets at the right time in winter, they can go for as low as 99 cents per kilogram. A total bargain. That, plus my love for all things citrus, soon brought me to the conclusion that mini vegan mandarin muffins were the obvious choice for this baking adventure. So I whipped up about a dozen mini muffins the night before, and, of course, taste-tested them with Simon to make sure they were okay for feeding my colleagues. Our verdict was: most definitely. In fact, Simon was a little too enthusiastic about the tasting, and I had to shoo him away to protect my remaining muffins. - I used the peel of one mandarin in this recipe, which suits me well, but if you really love the peel, you can probably use two mandarins' worth. - The oven I used resulted in some muffins being browner on top than others. In my pictures of these muffins, the mandarin segments on top may look burnt, but they tasted perfectly fine, surprisingly. And I preferred their appearance to the paler ones, but taste-wise it was a much of a muchness. - These are much lovelier, I feel, when they are still warm from the oven. I tried one the next day, and while it was still decent, it wasn't quite as alluring. They were just so addictive right after baking, with a little aromatic steam still wafting as you take a bite... so, yeah, eat them sooner rather than later, or, if they'd cooled down, perhaps heat them up in the oven again before serving. - Also, sprinkling sugar to create crunchy tops was a fabulous idea. Because the tops were oh-so-crunchy. However, even though I cooled the muffins before storing them, they weren't quite as crunchy the next day. Any ideas on how I may improve on keeping them fresh? I guess, as per above, I could warm them up in the oven briefly again before serving. 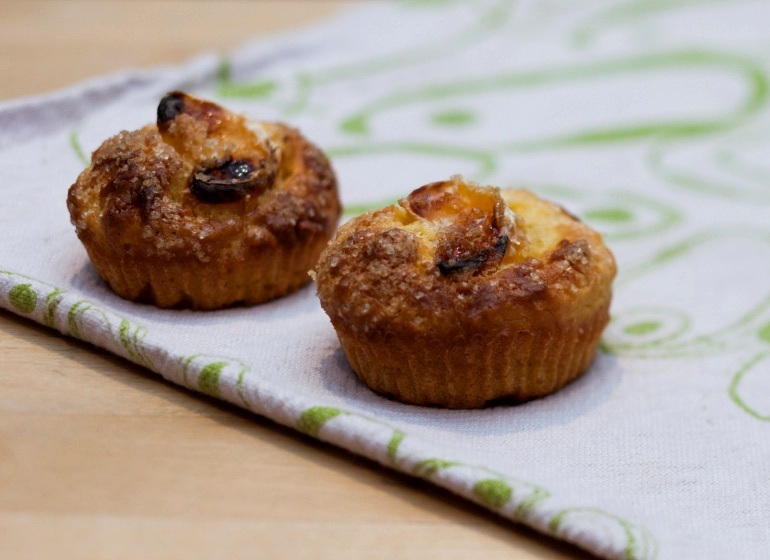 - If you would like to turn these mini mandarin muffins into mini mandarin cakes, simply adjust the amount of sugar. 1/3 cup sugar makes them just mildly sweet, and reasonably healthy as muffins should be. If I am to transform them into mini cakes, I would probably go for 1/2 cup sugar, but it really depends on your personal preferences. I'm more of a not-too-sweet kinda girl. - Being vegan, these muffins are naturally dairy-free and egg-free. They are also nut-free. You could potentially make them gluten-free, as well, using your favourite gluten-free flour mix substitute. 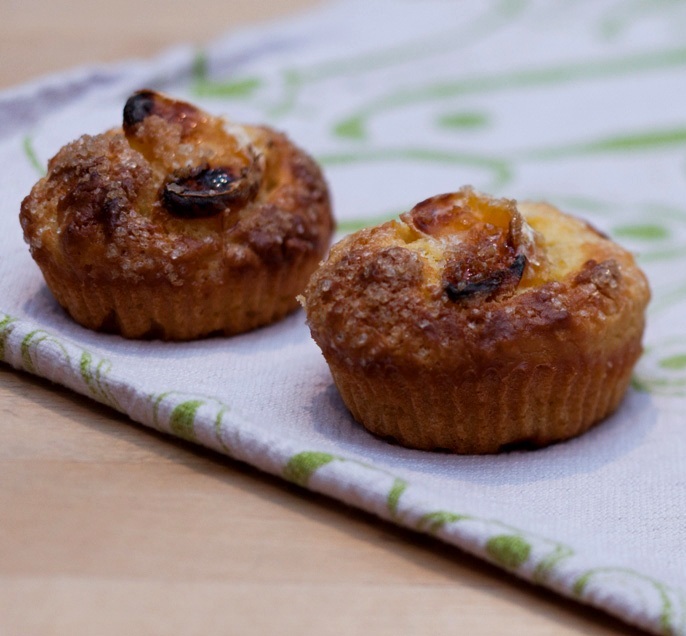 mini mandarin muffins, best eaten whilst still warm from the oven! Preheat oven to 160C fan-forced (180C regular). Combine flour, sugar and baking powder in a big bowl. Prepare the mandarins. Remove the stem bits on top, and any seeds. At this point, you want the flesh of 4 mandarins and the peel of 1 mandarin. Using a blender, blitz the mandarin flesh, mandarin peel, olive oil and salt until smooth. Stir through coconut milk. Stir the mandarin mix into flour mix. Do not over-mix, a bit of lumpiness is fine. The batter will be very thick. This is fine, unless there are still streaks of flour, in which case just carefully add a little bit more coconut milk until it all comes together. Divide the batter amongst 12 muffin wrappers slotted in a muffin tray. It'll probably only be enough to fill up halfway, hence the mini stature! Bake for 20 - 25 minutes until golden brown on top. These look amazing! Would never have thought to use mandarins! Yum! I love their stature. It's just like a muffin top with the bottom, and the top is the best bit of a muffin. Wasn't there a Seinfield episode about that? Haha yes, something like that! I also have vague recollections of that muffin top thing being referenced in some pop culture. leaf, i'd have to say that MOST cakes taste loveliest when warm! i often zap a slice of cake in the microwave to make the crumb soft and fluffy again. yummm...i've never baked with mandarins, so this is intriguing to me. That is very true! I do tend to prefer most cakes whilst they're warm (perhaps with the exception of some types of cheesecakes). But this was so significantly better whilst warm, that I thought I should include a note about it! My colleagues seemed to still enjoy them at room temperature, though. These look so cute and delicious, mandarins are such a delicious citrus fruit, just like you I adore everything with citrus. Ooh I have a large supply of mandarins at home I have been working my way through, but these look delicious! I think I shall have to give them a try!